The vast majority of electric toothbrushes available on the market today use sonic technology. That includes the Philips Sonicare, the Colgate, the Oral-B brands and many more. But, there is another type of sonic cleaning technology, it is called ultrasonic. It is quite uncommon to see these types of toothbrushes, but they do exist. In this post I will be taking a look at the key differences between the two types of brush, so that you understand how they are different. To help summarise the content quickly, I have created an infographic as a quick reference point for all the key facts. We then summarise with text and include a video explanation. Although there is text below that explains it all a video is better right? The following video was taken from YouTube and was not created by myself, but it explains and demonstrates fantastically an ultrasonic toothbrush. To be classified as a sonic toothbrush, the motion or vibration from the brush has to be quick enough to produce a ‘humming’ sound that is within the audible range of the human ear (20 Hz to 20,000 Hz). Sonic brushes typically offer 12,000-24,000 oscillations or 24,000-48,000 movements per minute. Examples of a sonic brush include Oral-B’s range of electric brushes as well as Philips Sonicare range. An ultrasonic toothbrush does not rely on the physical motion of the brush head and bristles to clean the surfaces of the teeth. Instead, an ultrasonic toothbrush uses a very high frequency of vibration, which is referred to as ultrasound to remove plaque and bacteria from the teeth. Essentially it is sound waves, that are invisible to the human eye that is actually cleaning the teeth. The classification of an ultrasonic toothbrush requires the brush to emit a wave of 20,000Hz or 2,400,000 movements per minute. This is considerably more than 12-48,000 of the very popular sonic electric toothbrushes that most of us know and relate to. Where a sonic toothbrush requires the physical motion of the brush bristles to clean the teeth surfaces and gumline, the ultrasonic brush does not. You could simply rest it on each tooth. However, many ultrasonic brushes do also provide additional sonic vibration ranging from 9,000 to 40,000 movements per minute, in order to provide additional sweeping motion which removes food particles and bacterial chain remnants. By adding this additional sonic motion, it not only potentially makes the brush more practical, it more than anything makes it more acceptable, because society is not used to toothbrushes that don’t actually have bristles! The following is a promotional video for Ultrasonic toothbrush manufacturer Megasonex, but it explains with visuals just how it works. 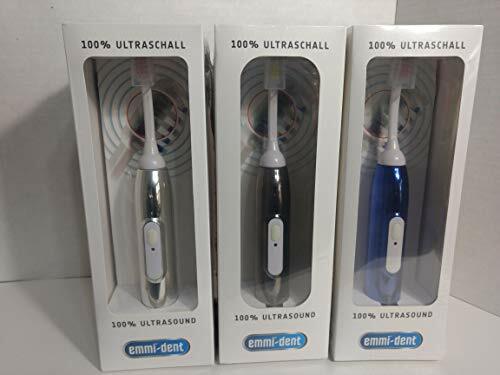 Of the 3 brands, it is only Emmi-Dent that are actively selling their products, with the others being virtually impossible to buy, so at this moment in time it looks like this is your best bet if you want an ultrasonic toothbrush. At the time of writing we also saw some listings for Emmi-Dent brushes on eBay and some for Megasonex. If you’re not specifically looking for ultrasonic, but rather a ‘standard’ electric toothbrush, check out our guide here that looks at the best sonic toothbrushes. If you are looking for side-by-side comparisons of sonic and ultrasonic electric toothbrush models, I can at this time confirm I or anyone else on the team has yet to write such comparisons as there is little demand for such. If you want to contact us, we will gladly help where we can, if you need further assistance. I wonder if there are any studies that determined if there is a higher risk of brain tumors with the ultrasonic machines? I am not aware of such studies specifically in relation to brain tumors. I believe some studies have looked at the effects of the electromagnetic fields of such devices. thank you for the great overview and toothbrush technology comparison. Please allow a couple comments. 1) Zero abrasion and most gentle cleaning – because there is not brushing action and ultrasound toothpastes do not contain abrasive particles. Hence, teeth and gums are cleaned most gentle. Abrasion is a serious dental care challenge – often driven by wrong brushing techniques, and leading to receding gums and exposed tooth rootshttps://en.wikipedia.org/wiki/Abrasion_(dental) . Cleaning with Ultrasound eliminates this risk. 2) The 2nd big advantage over bristle cleaning is reach. Ultrasound generates millions of nano-size cleaning bubbles that reach into the tiniest crevices, gum pockets, fissures, behind braces and ultrasound waves are even penetrating the gums. Thereby, Ultrasound kills and cleans away bacteria in areas bristles cannot reach. I hope this clarifies a bit the differences between abrasive mechanical brushing and gentle ultrasound cleaning. If you need any more information, I’d be happy to provide it to you. Please tell me more about the Emmident Ultrasound toothbrush! Thanks!